Pick Analysis: Kittle's Hawkeyes ties are strong, as his father, Bruce, was a co-captain on Iowa's 1982 Rose Bowl team. One cousin, Jess Settles, was an excellent basketball player for Iowa in the mid-nineties and another is former Iowa and current Denver Broncos tight end Henry Kreiger-Coble. Kittle redshirted in 2012, played in a reserve role in 2013 (5-108 receiving) and 2014 (1-25 receiving). He shared playing time in 2015, starting six of 14 games, catching 20 passes for 290 yards and a team-high six receiving touchdowns. 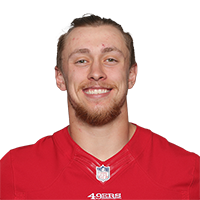 Kittle was an honorable mention All-Big Ten pick last season (11 starts, 22-314, four TD), even though he was limited by a foot injury the second half of the year. Published: April 29, 2017 at 02:18 p.m.
Comedian Al Madrigal announces the San Francisco 49ers selection of Iowa tight end George Kittle in Round 5 with the No. 146 overall pick in the 2017 NFL Draft. Published: March 29, 2017 at 10:30 p.m.
Iowa Hawkeyes tight end George Kittle goes through drills at the 2017 NFL Scouting Combine.